The tents housing the “Forbes Under 30” conference have been going up at City Hall Plaza, one of five venues for the event. Can hosting a conference convince millennials that Boston is the place to be? It’s an unconventional approach for an unconventional problem. Boston, one of the most youthful cities anywhere thanks to its colleges and universities, can’t seem to hold onto its young after they graduate. The issue is so vexing that it’s caught the attention of Boston Mayor Marty Walsh, Governor Charlie Baker, and a group of local CEOs who have decided to roll out the red carpet for the Forbes Under 30 Summit, which gets underway next week. It’s as if we are a region that remains haunted by what could have been when Mark Zuckerberg started Facebook in a Harvard dorm room in 2004, only to drop out and move his company to California, where he found receptive investors. Today the social media company is worth about $370 billion. The 3-year-old conference — previously staged in Philadelphia — is built around Forbes magazine’s annual list highlighting the world’s brightest minds and entrepreneurs under the age of 30. The four-day confab begins on Sunday and will draw an estimated 5,000 attendees from more than 60 countries. The conference, spread across five venues in the city, is as much about deal-making and networking as it is about having fun. Fidelity Investments, for example, is sponsoring a discussion on access to capital at Faneuil Hall. Harvard Business School will host sessions on the creative economy. Meanwhile, two entrepreneurs under 30, one profit and one nonprofit, will each win a $500,000 prize in the conference’s “Change the World” pitch contest. Celebrity speakers abound: Jessica Alba, Ashton Kutcher, Maria Sharapova. 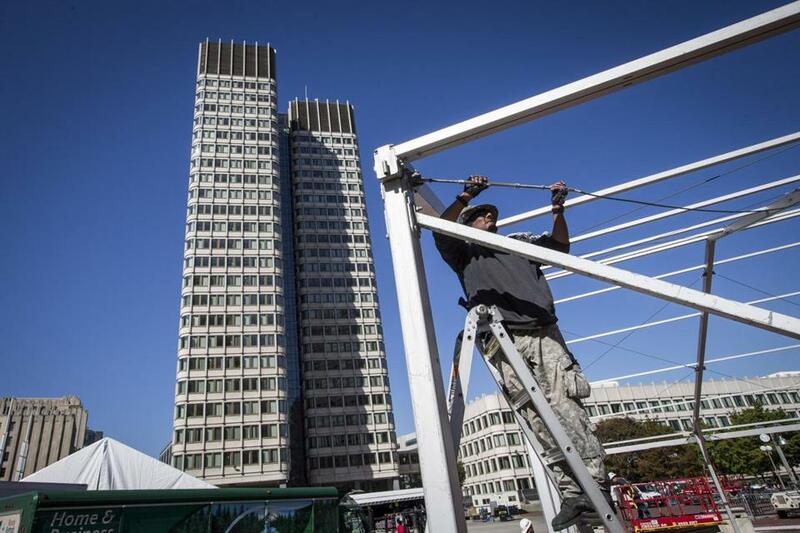 A “startup village” is being built on City Hall Plaza that will include a stage for musical acts and a beer garden. The conference will even feature its own beer: a limited edition “Millenni-Ale” courtesy of Boston Beer Co., brewer of Samuel Adams. “It’s the ultimate youth conference, and it’s a great statement of how far Boston has come,” said Dan Koh, Walsh’s chief of staff who has attended the event in Philadelphia. Koh made the Forbes Under 30 list in 2014 for his role at Huffington Post, where he worked before coming to City Hall. Another bonus: The ability to show off home-grown tech talent as if to tell the world, yes, you can make it here. Among the Boston entrepreneurs who will be featured are WayFair cofounder Niraj Shah , DraftKings cofounder Jason Robins, and Peter Boyce, cofounder of Rough Draft Ventures, which invests in college startups with money from Cambridge venture firm General Catalyst. The full-court press to bring the Forbes conference to Boston began in January after a small group dinner General Catalyst cofounder David Fialkow organized at the Algonquin Club. The private Boston club may be the last place you would find key players in the innovation economy, but there they were, including HubSpot cofounder Brian Halligan, Vertex CEO Jeff Leiden, Rue La La founder Ben Fischman, and MIT executive Israel Ruiz. Walsh and Koh also attended. He, fellow CEOs, and Walsh made a pact that night. “Let’s work together to find one or two major things we can win on,” recalled Fialkow. That something became marshaling business and political support to bring the Forbes summit to Boston. At the time, the magazine was exploring a move out of Philadelphia. The summit had been underwritten by a city-controlled nonprofit but that was unlikely to continue amid some controversy. Forbes subsequently told the city it no longer needed a financial guarantee. A few weeks later, some of the CEOs from the original dinner, along with Walsh and Koh, met in Governor Baker’s office with Lane, the Forbes editor, to discuss the summit. The Baker and Walsh administrations were just coming off a huge coup: luring General Electric to relocate its headquarters to Boston from Fairfield, Conn. How closely the governor and mayor worked well together with business leaders impressed GE executives, as it did Forbes. Then it was Walsh’s turn to host a meeting in February at the Parkman House, a city-owned mansion that serves as the mayor’s ceremonial residence. A bigger group of business leaders gathered, including Suffolk Construction CEO John Fish, Boston Beer founder Jim Koch, and Greater Boston Chamber of Commerce chairman Nav Singh. Shortly after that meeting, Forbes picked Boston, and both Baker and Walsh attended the press conference in March at Faneuil Hall. As eager as they were to bring the summit to Boston, they pledged no public money, nor did Forbes ask for any. Instead the magazine relied on drumming up local business support. Business leaders hope that Forbes will make Boston a permanent home for its annual summit. Lane said it’s too early to make that commitment. “We want to get through this year and see how it goes,” he said. Many of us know that Boston is a great place to do business, but our reputation as old and stodgy still lingers like the scent of bay rum in a barber shop. We need to work on our brand, and events like Forbes and HUBweek give us that chance.